You can try our varietals and vintages including: Syrah, Zinfandel, Sangiovese, Tempranillo and Grenache. We offer the full spectrum of red wines from light and fruity to full bodied and earthy. 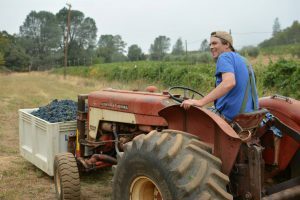 Other wines include Rosé and Late Harvest Zin, both of which offer a unique tasting experience. Great Wine starts at the Vine! We love producing our own wine grapes and wines — what else would Farmer Kirk do with his PhD in Biochemistry? The Smokey Ridge vines were planted in 1999, with additional vines planted in 2012. Kirk is a stickler in growing premium, perfectly mature grapes and it shows in our wines. We call ourselves a boutique winery, which is actually an understatement, as we only make 500 cases of exceptional wines each year! Join Our Forks & Corks Club! As a Smokey Ridge Forks & Corks Food and Wine Club member you can enjoy goodie packages including a bottle of estate produced wine, a featured house-made preserve or condiment—all tied together with a special recipe. Packages will be released four to six times per year. Members can bring four guests to our club events at the member price! Get all our specials in your inbox and stay up to date on all the great things happening here at Smokey Ridge by signing up for our official newsletter. We promise to keep you spam free!. Visit Us in Apple Hill! Wine Tasting at the Barn will open Saturday, April 6th! We will be open for wine tasting and sales on Saturday & Sunday each week from 11a -..